The PHQL mobile lift table is designed for safe ergonomic lifting, positioning, load transfer, assembly, manufacturing, and maintenance and repair operations. 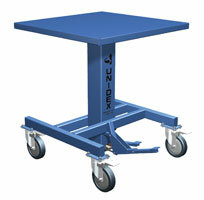 It has a 500-pound load capacity and large platform tabletop. The “Quick Lifter” raises the table from a height of 28 inches to 44 inches. An ergonomic foot pedal allows for adjustable down-speed to lower the platform.